Openherd: Woody Acres is a farm located in Saskatoon, Saskatchewan owned by David L Wood. Woody Acres is located a short driving distance south of Saskatoon, Saskatchewan, Canada. It is set on 80 Acres of gently rolling hills, interspersed with groves of trees and lush pasture. It is ideally suited to raising some of the best huacaya alpacas you will find anywhere. Our herd is maintained at around 40 huacaya alpacas largely composed of the following bloodlines: Peruvian Accoyo White Lightning, Pperuvian Javier and Jolimont Peruvian Pauco, Jolimont Peruvian Alpamayo, Jolimont Peruvian Sculptor, Sweet William, Super Sam and Victor's Voccoyo. Colors include white, beige, fawn, brown, grey and black. Most animals are registered in Canada & USA, some are registered in Canada only. Our breeding objective is to produce fibre animals that possess extreme fineness coupled with high density to maximize the value of the fleece used in the production of fine garments and to provide superior breeding stock to those that desire a presence in this industry. Who you purchase your alpacas from, as with many things, can be more important than which animals you choose. It is very important to have support should you need it, both before & after the sale. Our service does not end with the transaction. As long as you need assistance of any kind, we will provide the support you need. We want you to feel comfortable about coming to Woody Acres. We want you to feel secure in the knowledge that you have made an excellent business & lifestyle decision. In any transaction, we believe we all want to feel that we have been treated fairly and here, at Woody Acres, we work hard to instill that confidence in all our customers. We also provide assistance with ranch facilities design & layout, guidance in handling, nutrition & feeding along with preventative medical care of the alpacas. If you purchase alpacas from us & need a place to board them for a short term or longer, we can help you out. 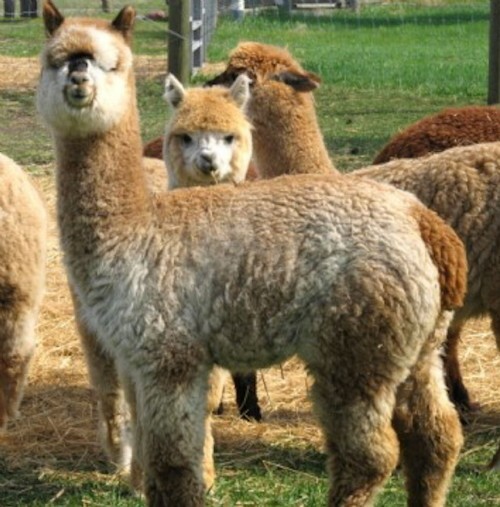 All alpacas are sold with full health and reproductive guarantees. Reproductive guarantees do not apply to pet stock or geldings, of course. If you see a special alpaca you like, please let us know and we can provide you with additional information, photos and pricing. Sales Include: > Ownership registration transfer upon receipt of full payment. > Veterinarian health certificate / report if requested > Reproductive guarantee for dames and sires only. > Free board for up to 6 months or a year for cria less than a year old. > Free delivery up to 200km. > Delivery arrangements for any place in North America. Terms Available from Woody Acres Alpacas. > Free boarding and birthing for late term pregnant females. Please note: all alpacas purchased on contract must be insured for full mortality with Woody Acres named as co-beneficiary so long as there is any unpaid balance. We realize that the terms suggested above will not meet everyone's needs. For instance, some people want to make a smaller down payment and additional periodic principal payments or higher monthly payments. We encourage you to submit an offer that works for you.